In 1944, Italy was split in two by the war. Liberated from Rome to Sicily, with the first democratic government in twenty-three years, occupied by the Nazis and still governed by Mussolini in the North. The film industry was also split in two. Before abandoning Rome, Mussolini's Republic moved the Cinecitta equipment to Venice and with second-rate actors and directors tried to make films. Since the outcome of the war was obvious, few people felt like jeopardizing themselves, and the films that came out of the makeshift Venetian studios were bland little comedies that were so uncompromised by Fascism that they circulated without any trouble after the war was over. In Rome, Cinecitta, stripped of its equipment and confiscated by the Allies, was of no use. But in that same year of 1944, the Italian cinema somehow or other came back to life, utilizing the few remaining studios and even private homes. 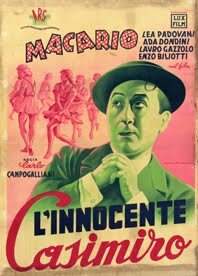 For the records, the first film to be put into production in liberated Rome was precisely a comedy, L'INNOCENTE CASIMIRO [CASIMIRO, THE INNOCENT], directed by Carlo Campogalliani, with Macario, but it was an insignificant little film that seemed to belong to some remote past. It was only natural that the immense ordeal of pain and suffering endured by the Italians with a war that started as a mistake and ended in defeat, should have led to the firm determination to build a new Italy. So there was a desire to meditate upon what had happened, to sing of the tragedy and the struggle for freedom, and also to come to terms with the enormous problems of the post-war period, with the country physically in ruins and racked by hunger and unemployment. This state of mind - which was at once anger at the mistakes of the past, compassionate remembrance of the dead, solidarity for the survivors, trust and determination for the future - gave rise to the rejection, on the part of many film-makers, old and young, of movies as duplicity, deceit, escape, and the search, also through films, for a closer contact with the human and social reality of the country. It is this that explains the neo-realistic phenomenon. It was not - like French surrealism, German expressionism, Russian realism - an artistic trend, a "school": De Sica, Visconti, Rossellini, the three masters of neo-realism, were in fact extremely different in their style, in their approach to film-making, in their subject matter. What united them was, above all, the above-mentioned state of mind, which led to a specific moral choice.